Denny’s Red Velvet Pancake Puppies with Cream Cheese Icing is a new menu item that is appearing on their Hobbit inspired movie menu. You can create these delicious Red Velvet puppies at home. Denny’s has a wonderful seasonal menu, this red velvet puppies were added to the menu that was inspired by the Hobbit movie. These red velvet puppies have white chocolate chips on the inside, and you can dip these warm red velvet treats into a sweet creamy cream cheese frosting. With this copy cat recipe you can prepare of these long after the movie leaves the theater. These treats would make a great addition for a party or a large gathering. These can be made in a jiffy. My tip is after you make these treats you will not be able to use the oil for frying for anything else, so be sure to use the oil only for these, or the next thing you try to cook in the oil will turn red. Recreate Denny’s Red Velvet Puppies with Cream Cheese Icing with this copycat recipe. In a medium-sized bowl combine cake batter mix and 3 eggs. Use a blender to mix until the batter has no lumps. Add 1/2 cup of white chocolate chips and mix in with a spoon. Use a 1-ounce cookie scoop to drop batter into hot oil. Fry on one side for approximately 1 minute and then flip over and fry on another side for about a minute. Remove pancake puppy onto a plate lined with paper towels. This grease will not be usable for anything but making these red velvet puppies, the oil will turn red. So be sure to make something else first and finish up with these. Make cream cheese dipping sauce by combining cream cheese and butter in a medium-sized bowl. Beat together cream cheese and butter until they are light and fluffy. Add approximately 1/2 cup powdered sugar, into butter and cream cheese. Once the first portion of cream cheese has been incorporated add the next portion, and then the remaining powdered sugar. Add vanilla, lemon extract, and 1 tablespoon of milk. Blend in flavorings and milk. 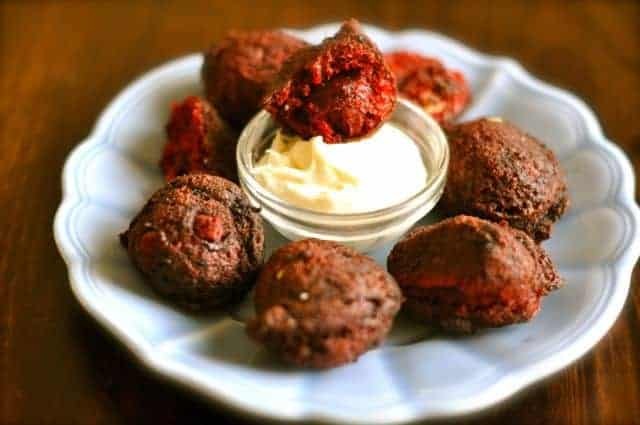 Place dipping sauce into a small bowl and serve with red velvet puppies. Do i make the cake mix like says on box or by directions on this list? As This recipe been updated yet? What about the water issue? Doesn’t say, but I’m assuming you use a Duncan Hines RED VELVET cake mix??? The water is not mentioned in the instructions. I assume it’s in the ingredient list in error. These are so cool. I could see myself popping one right after another in piehole. Did you make the cake directions and then add more water? I TRIED making these and sure enough I should NOT HAVE ADDED THE ! CUP OF WATER to the batter!! Ended up making a cake because the batter was to thin to deep fry!!! So whoever listed this recipe ITS WRONG with the 1 cup of water!!!!! The frosting??? AMAZING!!!!! Did you make the batter as listed on the box, and then add an additional cup of water? So what’s the verdict add 1 cup of water or no? I wanna make these for a party so I need to know….